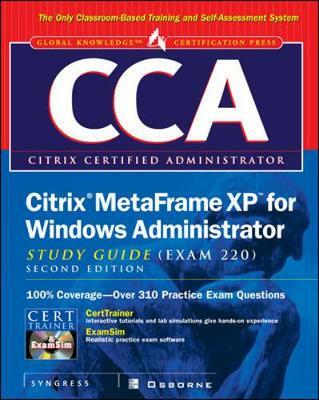 CCA Citrix MetaFrame XP for Windows Administrator Study Guide (Exam 220) - Certification Press S.
This text provides complete coverage of all exam objectives for Exam 220. It consists of an integrated study system based on proven instructional methodology, it includes special pedagogical elements such as step-by-step exercises, Exam Watch and On the Job notes, and quick reference Scenario and Solution tables. There are more than 250 practice exam questions which match the actual exam questions in content and feel. All answer options, correct and incorrect, receive a detailed explanation as to why the answer is or is not correct. The self-test section includes knowledge- and scenario-based questions that match the actual exam questions. The software package includes CertTrainer CBT software and the ExamSim testing engine, with all new questions found only on the CD-ROM. The CD-ROM also features instructional graphical animations with audio explanations and an eBook, the electronic version of the study guide.